Kimora Lee Simmons is a fashion model from the USA who is also the Creative Director and president of ‘Just Fab’. Simmons grew up just outside St. Louis, Missouri to a black father and a Korean-born Japanese mother. When she was a young girl growing up in a northern suburb of St. Louis called Florissant, Missouri, she received a lot of teasing and bullying from other students because of her height (she reached 5 foot 10 inches by the age of 10) and her mixed race ancestry. In order to help her build her confidence, her mother took her to a modelling class when she was 11 years old. She performed well and two years after that she was discovered by a representative for Paris Agency Glamour, at a Model Search in Kanses City. She was sent to Paris and her modelling career began as she worked with Karl Lagerfeld the well known Chanel designer. When she was chosen to close a Lagerfeld fashion show back in 1989, she gained a lot of attention in the fashion world. All of the traits that got her teased as a young girl such as her height and her mixed ethnic heritage were suddenly advantages in the modelling world. Kimona Lee Simmons has also made several television and film appearances, including in Brown Sugar, Beauty Shop and Waist Deep. She has also made appearances in music videos for Usher and Ginuwine. ‘JustFab’ is a personalized retailing and stylish service based in Los Angeles that produces and sells handbags and shoes to its members. Each member pays $39.95 as a monthly fee and they are allowed to choose one item from the website each month. When members sign up, they complete a survey that identifies their fashion preferences. Then, a personal stylist selects items which are based on these particular preferences and members can choose from this selection. The service has grown in popularity throughout the years and it now has more than 10 million members. JustFab has partnered with many celebrities, such as when Avril Lavigne teamed up with the company to launch her Abbey Dawn line of apparel, handbags and shoes in 2012. JustFab has also recently announced an exclusive line of women’s shoes and handbags from YouTube fashion icons Elle & Blair Fowler. She has also created a Kimora Lee Simmons Scholarship. This fund helps to provide college scholarships for academically high-performing female students who have financial needs at the high school she attended in St. Louis. In addition, Kimora is an active member of several organizations for youth advocacy including Keep a Child Alive, Rush-Philanthropic, Hetrick-Martin Institute, Amfar and the G&P Foundation. To honour the positive work that she has done for the city of St. Louis, the mayor of the city presented Kimora with the key to the city and determined that March 18, 2008 was to be ‘Kimora Day’. 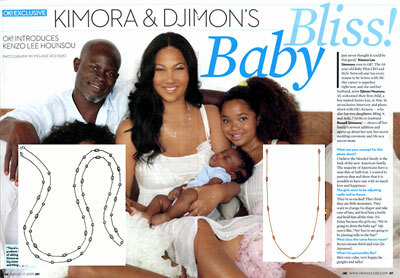 Kimora Lee Simmons is pictured here wearing the Diamond by the Yard Necklace by KC Designs.